A luxurious 18ct gold collection full of drama and elegance. The Whispering Collection emulates femininity and glamour, with its sculptural yet delicate filigree detail. The small pear stone earrings is available in black rhodium plate set with 0.07ct white diamonds and 8ct green amethysts or 8ct purple amethysts. Also, available in 18ct yellow gold with 0.07ct white diamonds and 8ct citrines. 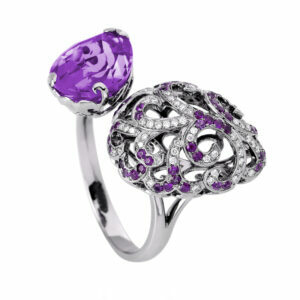 Emulating femininity and glamour, the Whispering collection is full of colour and form. 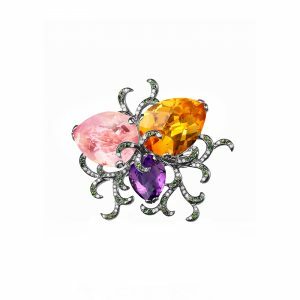 A vibrant collection set with coloured gemstones and diamonds for the added luxury jewellery.